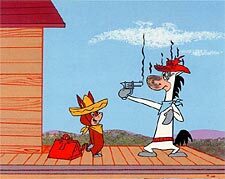 Another favorite character of the Quick Draw cartoons was actually a secret identity of McGraw himself. Donning a black cape and mask, the lawhorse would become El Kabong, so named because his weapon of choice was an acoustic guitar which would make that distinctive sound when used. The Ruff and Reddy Show actually launched the Hanna Barbera studio into its incredible creative dominance of animation for television in 1957, followed by the Huckleberry Hound Show in 1958 and then the premiere in 1960 of the stone age hit The Flintstones. This fabulous Limited Edition Cel was created by studio artists inspired by artwork from the original production and is signed by small screen legends Bill Hanna and and Joe Barbera. (Although not visible in our scan, Train tracks and the artists signatures are just below the wood sidewalk in the actual artwork.) The total edition size is just 200 works of art.